Trudy James offers a particularly pretty take of the classic heart figure with textured sterling silver. Anybody who's ever loved another person deeply understands exactly what e.e. cummings meant when he wrote, "I carry your heart with me (I carry it in my heart)." 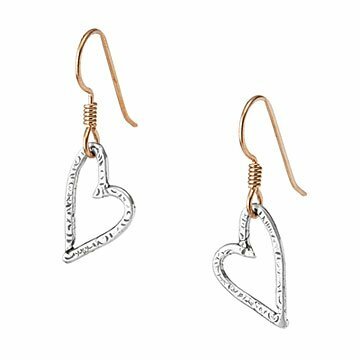 California artist Trudy James brings that idea to life with her Heart to Heart earrings, which feature sterling silver hearts that dangle within bronze rings. The textured mixed-metal design conveys enduring love and protection, and will inevitably remind the wearer of the person she holds most dear. Handmade in San Diego, California. Make it a set! Click here to see the matching Heart to Heart Necklace . Unique and Personal is the way to go. Overall I'm very Happy with these earrings. They are Absolutely Adorable! What girl doesn't love a heart. They are the perfect size for her age and the hearts will remind her of our enduring friendship each and every time she puts them on.